When opportunity knocks it's often when we are least prepared. We were outside Tabuk in the Mountain province, climbing up the Maligcong Rice Terraces when we suddenly found the path forward blocked by a most unusual sight. 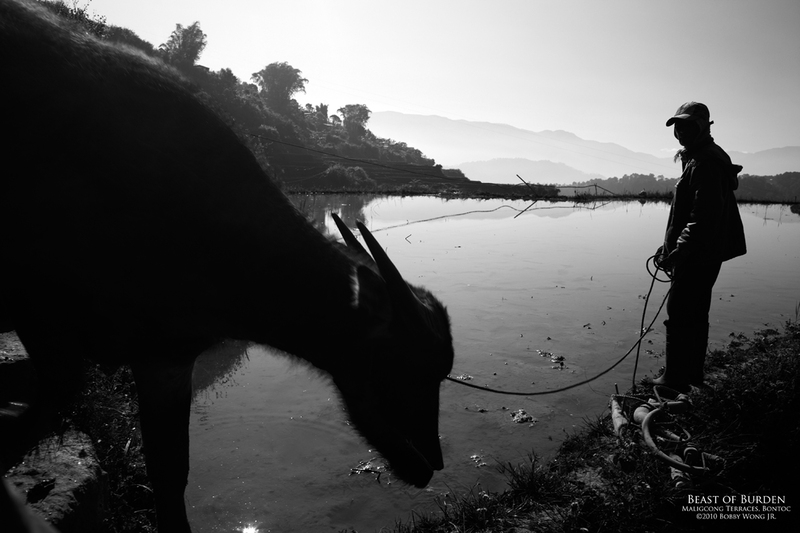 A farmer was coming down the steps, and behind him, his water buffalo in tow. Now we all know low-land farmers use carabaos to plow their fields, but how do they do it high up on the terraces? They've taught their beasts-of-burden to climb, of course, and quite deftly so. There wasn't time to ponder our composition. We quickly got out of their way, some of us dropped down onto our knees, and then gave it our best shot. Will it work? Not all the time, but an opportunity is a terrible thing to waste. Enjoy. Where in the world is the Maligcong Terraces in Bontoc, Mountain Province?